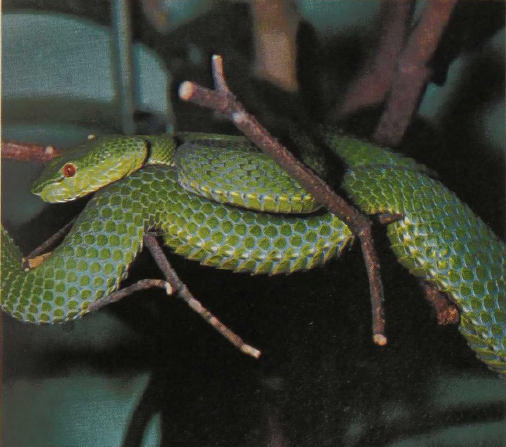 These green tree vipers still represent a thorough confusion since there must be more than ten kinds informally included under the single name. Two to 4 feet in length, they live in the low and highland forests of eastern Asia, are generally green, although some are brownish, show more or less patterned scales, have white, green, or red eyes, and are quite poisonous. Like other pit vipers they have erectile fangs. Most of the green species are excellent climbers and some of them parallel similar South American animals of the genus Bothrops in having prehensile tails with which they hook themselves into vegetation. Since they occur in mountains up to an altitude of 9,000 feet and tend to rest in tea and cardamom bushes, they represent a high risk for the pickers.